See attachment on how to delete. The images are stored within the app, you can export to iCloud Drive, Google Drive etc but not directly into the Apple Photos app. Ah, thank you for that. It wasn't particularly obvious hence why I couldn't figure out how too. You can Export images to Photos by tapping on the Share button in the Export Page. You can also Export to other Cloud drives, such as Dropbox or Amazon Drive by tapping on Locations in the Export Dialog. 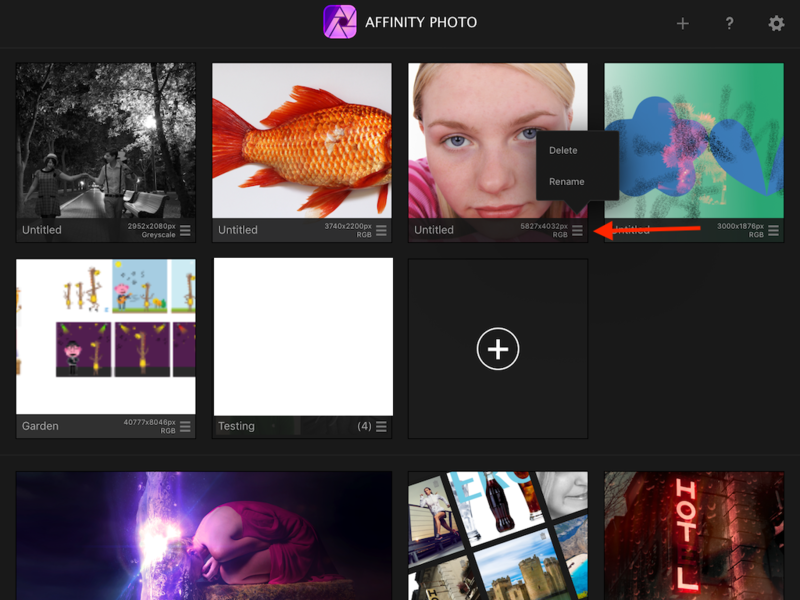 Hi, does anybody know how to select and delete multiple pictures from Affinity Photo (iPad)? As far as i know currently it's not possible to delete multiple files from the Welcome Screen even if they are placed inside a folder. Thank you, I've already figured out how to do it via Project folder. BTW thanx guys for amazing piece of software. Yes, It's the newest public beta. Oh no, my mistake, It's not possible to delete project, just rename. I expected the same structure of submenu as is used in photo. It would be great to have the ability to import, delete and manage multiple files on the welcome screen. Coming across to affinity from Aperture, this is the thing I find the most frustrating. Working with the photos in the the program is so easy, it’s great. I can do most of what I did in aperture, faster, except for having to handle one file at a time at import/export stages. Hey Guys, what do you think about the possibility of having an option to delete/rename/dissolve the whole projects on the welcome screen as mentioned above. It would be great to have the ability to import, delete and manage multiple files on the welcome screen. You can import multiple files from photos. Just open AP to Welcome screen. Make a folder and open empty folder (optional). Drag up from bottom of screen to show iOS springboard. Drag photos to side of screen. Tap and hold a photo. While holding, tap other photos you want to import. Now (without releasing) drag the selected files over and drop onto Welcome screen (or the open, empty folder) and release your finger from screen. All you selected images should now be in AP. For the rest we wait for Serif to add functionality. Sorry for being asay from this post for so long... Thanks for the advice, appreciated. Now able to delete as needed, thank you.